Neurological complications have been described with seasonal influenza infection. 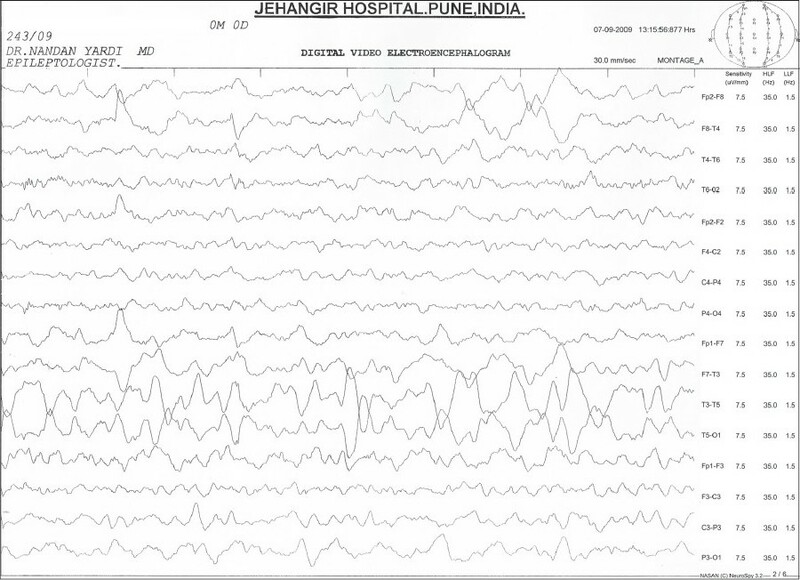 We report encephalitis manifesting as seizures in a child with confirmed H1N1 infection. Treatment with oseltamivir was started. 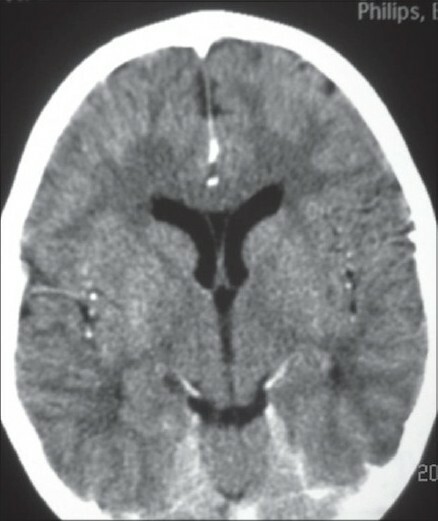 Child was discharged without any neurological sequelae. There are only few case reports describing the association of novel influenza A (H1N1) virus with encephalopathy or encephalitis in children. , We report a previously well child with confirmed H1N1 infection who presented with seizures, CSF pleocytosis, abnormal EEG and focal changes on CT brain. A previously healthy eight-year-old boy was brought to our institute during the current H1N1 pandemic with moderate fever, cough and occipital headache since five days and one episode of generalized tonic clonic convulsion, associated with fever, just before admission. Immediately after admission, he developed right-sided focal convulsions which were controlled with intravenous midazolam. On admission, the patient was afebrile with a blood pressure of 110/70 mmHg, a heart rate of 82 beats per minute and a respiratory rate of 24 per minute. Oxygen saturation measured by pulse oximetry was 97% on room air, and a rapid assay for glucose was 96 mg/dl. Child was drowsy with a GCS scale of 10/15. Pupils were 2 mm bilaterally and reactive. Terminal neck stiffness was present. Rest of the CNS examination was normal. Routine hemogram, blood gas and serum electrolytes were normal. A CT and lumbar puncture were performed in view of focal seizures and no improvement of sensorium after 4 hours of admission. CT was performed before lumbar puncture and showed ill-defined hypodensities (CT value 16-23 HU) in the subcortical white matter in the posterior parietal lobes bilaterally suggestive of encephalitis [Figure 1]. Lumbar puncture showed 40 cells/mm 3 , proteins were 48 mg/dl and glucose was 71 mg/dl with no organisms seen on gram stain. A chest X-ray revealed a small focal consolidation in the right lower zone. Nasopharyngeal aspirate specimen tested for H1N1 by RT-PCR tested positive. CSF was negative for H1N1 (by RT-PCR). CSF PCR for Herpes simplex virus was negative. Additional viruses such as enterovirus, varicella zoster, cytomegalovirus and Epstein-Barr virus tests could not be done due to financial constraints. Broad spectrum IV antibiotic, oseltamivir and acyclovir treatment were initiated. EEG showed evidence of focal slowing and sharp activity from the left centroparietal region [Figure 2]. The sensorium improved after 48 h and there were no further seizures. The patient was given oseltamivir for five days. He was discharged after 10 days of hospitalization. Figure 1 :CT brain showing ill-defi ned hypodensities in subcortical white matter in both parietal lobes. Figure 2 :EEG showing focal slowing and sharp activity from the left centroparietal region. Kimura et al divided influenza-related brain changes into five categories based on the MR imaging and CT findings: normal (category 1), diffuse involvement of the cerebral cortex (category 2), diffuse brain edema (category 3), symmetric involvement of the thalamus (category 4), and focal encephalitis (category 5). Our patient's CT findings are consistent with category 5 i.e. focal encephalitis. Lyon et al. reported CT and MR imaging findings in a 12-year-old girl infected with influenza A (H1N1) whose clinical course was complicated by acute necrotizing encephalopathy. The authors reported T2 hyperintensity and restricted diffusion in the thalami, cerebellar hemispheres and brain stem. Haktanir A. reported similar abnormalities and also bilateral perirolandic changes and diffuse meningeal enhancements. Treatment of seasonal influenza in children with zanamivir and oseltamivir provided a more rapid resolution of symptoms and illness from 0.5 to 1.5 days. No randomized, controlled studies have examined the antiviral treatment on influenza-related neurologic complications and it is not clear whether the treatment resulted in any clinical improvement or whether the neurologic symptoms were self-limited. Nonetheless, antiviral treatment should be initiated as soon as possible for any patient with neurologic symptoms related to H1N1 virus. To the best of our knowledge, our patient is the first reported case of H1N1-related neurological manifestation from India. Clinicians should be alert to the potential for neurologic complications associated with H1N1. 1. Centers for Disease Control and Prevention (CDC). Neurologic complications associated with novel influenza A (H1N1) virus infection in children Dallas, Texas, May 2009. MMWR Morb Mortal Wkly Rep 2009;58:773-8. 2. Webster RI, Hazelton B, Suleiman J, Macartney K, Kesson A, Dale RC.Severe encephalopathy with swine origin influenza A H1N1 infection in childhood: Case reports. Neurology 2010;74:1077-8. 3. Newland JG, Laurich M, Rosenquist AW, Heydon K, Licht DJ, Keren R, et al. Neurologic complications in children hospitalized with influenza: Characteristics, incidence and risk factors. J Pediatr 2007;150:306-10. 4. Amin R, Ford-Jones E, Richardson S, MacGregor D, Tellier R, Heurter H, et al. Acute childhood encephalitis and encephalopathy associated with influenza. A prospective 11-year review. Pediatr Infect Dis J 2008;27:390-5. 5. Fujimoto S, Kobayashi M, Uemura O, Iwasa M, Ando T, Katoh T, et al. PCR on cerebrospinal fluid to show influenza-associated acute encephalopathy or encephalitis. Lancet 1998;352:873-5. 6. Fukumoto Y, Okumura A, Hayakawa F, Suzuki M, Kato T, Watanabe K, et al. Serum levels of cytokines and EEG findings in children with influenza associated with mild neurological complications. Brain Dev 2007;29:425-30. 7. Wang GF, Li W, Li K. Acute encephalopathy and encephalitis caused by influenza virus infection. Curr Opin Neurol 2010;23:305-11. 8. Chen YC, Lo CP, Chang TP. Novel influenza A (H1N1)-associated encephalopathy/encephalitis with severe neurological sequelae and unique Image features - A case report. J Neurol Sci 2010;298:110-3. 10. German-Diaz M, Pavo-Garcia R, Diaz-Diaz J, Giangaspro-Corradi E, Negreira- Cepeda S. Adolescent with neuropsychiatric symptoms associated with novel influenza A (H1N1) virus infection. Pediatr Infect Dis J 2010;29:570-1. Wu, C. and Cheng, X. and Wang, X. and Lv, X. and Yang, F. and Liu, T. and Fang, S. and Zhang, R. and Jinquan, C.
Khosla, P., Aggarwal, M., Jain, S.